How do you teach a child engineering? Few days ago, i read a post on Bill’s personal blog about the time Camille Jones visited him in his office and they talked about how to teach a 5 year old engineering. If you had asked me before that day how to teach a 5 year old engineering, my answer would have been that i was not sure. Having an 8 year old myself, i struggle with teaching her about what i do in Tech. She is a curious cat like me, but definitely not timid like i was growing up which means she is always asking questions. Most weekends we watch how-to videos on her interests, other times i look for practical video explanations to questions she has asked but i cannot explain. Questions like, how do they make clothes? Which led us to cotton, and of course she then asked how cotton is planted and processed into fabrics. Watching Camille show Bill how she teaches engineering to children opened up my mind to a whole new and different perspective about learning. Of course, i had always propose to my students that they could learn by listening (podcasts), watching videos and reading (blogs, books, texts, etc). What if, being visually artistic is the new way to learn? What if we lay emphasis on this mode of learning? Imagine how much easy and fun learning would be, think of how better educated we will become. Just maybe, mathematics would have been my favourite subject. Of course we practiced building a house following the illustration Camille made after watching the video together. Luckily, i have coins left from my 2015 trip to Ghana. We had fun, we both learnt something new, she even wanted me to record her video doing the illustration but my phone memory was full. I took pictures instead. What methods do you employ when teaching kids about a subject that is hard to explain theoretically? Do share with us in the comments section, let us learn from one another. If you ask me, i am 100% behind Camille’s idea that STEAM (Science, Technology, Engineering, Arts and Mathematics) be introduced to children at kindergarten level. Let’s show them all the opportunities in the world today. Tags: How to teach engineering to a 5-year-old. 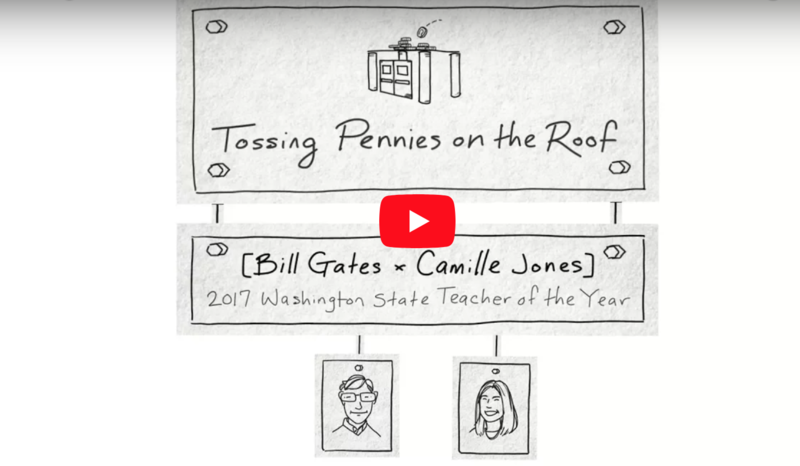 By Bill Gates and Camille Jones. Previous If you die, you die!